A fedayi group fighting under the ARF banner. The banner reads Liberty or Death. 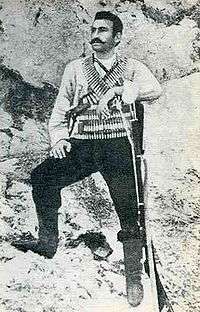 Fedayi (Western Armenian: Ֆէտայի Fedayi; Eastern Armenian: Ֆիդայի Fidayi), also known as the Armenian irregular units or Armenian militia, were Armenian civilians who voluntarily left their families to form self-defense units and armed bands in reaction to the mass murder of Armenians and the pillage of Armenian villages by criminals, tribal Kurdish forces, and Hamidian guards during the reign of Abdul Hamid II in late 19th and early 20th centuries, known as the Hamidian massacres. Their ultimate goal was always to gain Armenian autonomy (Armenakans) or independence (Dashnaks, Hunchaks) depending on their ideology and the degree of oppression visited on Armenians. Some of the key Fedayi figures also participated in the Iranian Constitutional Revolution that commenced during the same period, upon agreement of the ARF leaders. The Armenian term fedayi is ultimately derived from Arabic fedayeen: فدائيون fidā'īyīn, literally meaning "those who sacrifice". The Bitlis Vilayet (historic Taron) was the center of fedayi operations in the late 19th century and early 20th century. Armenian fedayis' main goal was to defend Armenian villagers from persecution and at the same time, disrupt the Ottoman Empire's activities in Armenian populated regions. 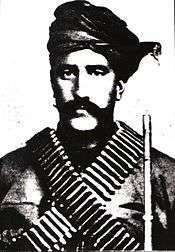 Armenian volunteers fought during Hamidian Massacres, Sasun Resistance (1894), Zeitun Rebellion (1895–1896), Defense of Van, and Khanasor Expedition. They were the leaders and members of the Armenian national movement. These bands sabotaged telegraph lines and raided army supplies. They also committed assassinations and counter-attacks on Muslim villages. They helped Armenians defend themselves during village purges by Ottoman officials. They were supported by Armenians and quickly gained fame, support and trust by them. Their activities in the Ottoman Empire dissipated after the Second Constitutional Era of the Ottoman Empire, when the Committee of Union and Progress came into power and, for a time, granted the Empire's Armenian citizens the same rights as its Turkish and Kurdish citizens. Most fedayi groups then disbanded, their members returning to their families. Several fedayi and ARF key figures such as Aram Manukian, Hamo Ohanjanyan and Stepan Stepanian agreed upon joining the ongoing Iranian Constitutional Revolution in neighboring Qajar Persia. They established that the movement was one that had political, ideological and economic components and was thus aimed at establishing law and order, human rights and the interests of all working people. They also felt that it would work for the benefit and interest of Armenian-Iranians. The final vote was 25 votes in favour and one absentia. Some fedayi groups joined the Ottoman army after the Ottoman government passed a new law to support the war effort that required all enabled adult males up to the age of 45 to either be recruited in the Ottoman army or to pay special fees (which would be used in the war effort) to be excluded from service. As a result of this law, most able-bodied men were removed from their homes, leaving only the women, children, and elderly by themselves. Most of the Armenian recruits were later turned into road laborers, and many were executed. The Genocide, committed during World War I by the Ottoman Empire, gave way to the return of the fedayis, who reorganised themselves once again inside the borders of the Ottoman Empire. In turn, tens of thousands of Armenians volunteered to be drafted in several different armies. These Armenian volunteer units were formed inside the Russian army to fight against the Ottoman Empire. The Russian Caucasus Front collapsed following the abdication of the Tsar. In 1917, the Armenian Congress of Eastern Armenians asked the Armenian soldiers and officers scattered throughout Russian occupied regions to gradually be brought together. The plan was to mobilize Armenians on the Caucasian front. With that purpose in view, an Armenian Military Committee was formed with General Bagradouni as its president. That year, the Armenian National Congress created the Armenian National Council which created to the First Republic of Armenia. These Armenian conscripts and volunteers from the Russian Army later established the core of the armed forces of the First Republic of Armenia. Armenians refugees from the Ottoman Empire were flooding to the newly formed Armenian state. 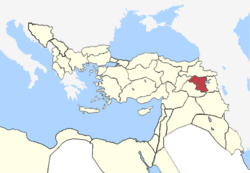 Further southeast, in Van, the fedayis helped the local Armenians resist the Turkish army until April 1918, but eventually were forced to evacuate and withdraw to Persia. To consider emergency measures, the Western Armenian Administration sponsored a conference which adopted plans to form a 20,000-man militia under Andranik in December 1917. 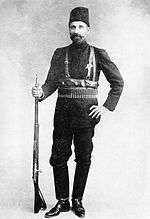 Civilian commissioner Dr. Hakob Zavriev promoted Andranik to Major General and he took the command of Armenia within the Ottoman Empire. They fought in numerous successful battles such as the Battle of Kara Killisse, the Battle of Bash Abaran and the Battle of Sardarapat, as fedayees merged with the Armenian army (Yerevan centered) under the General Tovmas Nazarbekian. In the Caucasus, where, without mentioning the 150,000 Armenians in the Imperial Russian Army, more than 40,000 of their volunteers helpeds to liberate part of the Armenian vilayets, and where, under the command of their leaders, Antranik and Nazerbekoff, they, alone among the peoples of the Caucasus, offered resistance to the Turkish armies, from the beginning of the Bolshevist withdrawal right up to the signing of an armistice." Boghos Nubar, as a part of the Armenian Delegation, intended to expand the independent First Republic of Armenia. Thus, he might have elevated the number of Armenian fedayees who were able to fight in order to show that the Armenians are capable of defending an eventually large Ottoman-Armenian border. In reality, their numbers at that time were much lower, considering that there were no more than a few handfuls of fedayees in most of the confrontations between them and Kurdish irregulars or Turkish soldiers, even according to foreign accounts. Moreover, many of the fedayees were the same and reappeared in various places and battles. 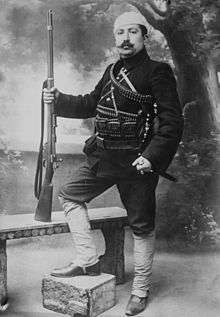 One should also note that many Armenian irregular fighters died defending regions of Western Armenia during the Armenian genocide. ↑ Tony Rea and John Wright (1993). The Arab-Israeli Conflict. Oxford University Press. p. 43. ISBN 019917170X. 1 2 Berberian, Houri (2001). Armenians and the Iranian Constitutional Revolution of 1905–1911. Westview Press. pp. 116–117. ISBN 978-0-8133-3817-0. 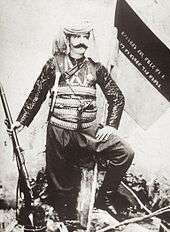 ↑ "Ottoman labour battalions". hist.net. Translated from the Armenian: Mihran Kurdoghlian, Badmoutioun Hayots, C. hador [Armenian History, volume III], Athens, Greece, 1996, pg. 59-62.